the unreasonable expectations demanded of school personnel. 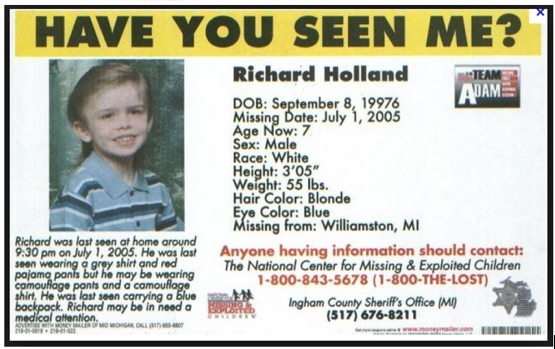 On July 2, 2005, Tim Holland reported his adopted son Ricky, 7, missing. Thus began a story that would grip the state of Michigan. It ended in a 6-week trial, with 55 witnesses, over 312 pieces of evidence, and $1 million cost to Ingham County to investigate. The community launched a huge 9-day search effort, with 1,700 volunteers trying to find the boy, but meanwhile, authorities were becoming more and more suspicious of the parents. While Tim and Lisa Holland beg people to find Ricky, investigators agreed that they didn’t act like parents of a lost child. When the investigation focused on the parents, Tom and Lisa Holland began to blame at each other for Ricky’s death. On July 27, 2005, Tom led the police to Ricky’s remains in a garbage bag that had been tossed into a swampy area near Danville. The parents had different, and changing, stories about how Ricky died, and the skeletal remains didn’t reveal cause of death. At first, Tim claimed that Lisa hit Ricky on the head with a tack hammer the evening of July 1, 2006, and ordered him to get rid of the body. A month later, when Tim pleaded guilty to 2nd degree murder and aiding and abetting first-agree child abuse, he said he wanted to tell the real truth about Ricky’s death. He admitted that he hadn’t actually seen Lisa hit Ricky with the hammer. A week before Ricky died, Lisa told him that Ricky had hit his head diving in a wading pool. All that week, Ricky was acting like a “zombie”: listless, glassy eyed, not eating or drinking, and unresponsive. He was unable to walk, and Lisa had him in a diaper. They argued whether or not to take him to the hospital. Lisa claimed to have taken the boy for care, but his head wound still looked uncared for. Later that week, Tom went to the hospital for a sprained ankle, but admitted that it didn’t occur to him to take Ricky with him. During the investigation of Ricky’s death, when over 2,000 pornographic images were found on his work computer, Tim was fired from his position in counterintelligence for the Army. Lisa claimed Tim was a violent man who killed Ricky and threatened her if she told. But it wasn’t a story that convince the jury. Two jail inmates testified that Lisa told them she had hit the boy with a tack hammer by accident. One asked Lisa if the boy had died right away, and Lisa indicated “no.” Asked if he suffered, she nodded “yes.” Most damning, the inmates produced a note Lisa had written that said: “I think it's too late now, but I have to tell someone. It was an accident. I didn't mean to." The jury found her guilty of first degree murder which carries a mandatory life sentence with no hope of parole. For his guilty plea and his testimony against Lisa, Tim got 30 to 60 years in a maximum security prison for reckless disregard in knowing Ricky’s death would be an inevitable consequence of his neglect. Ricky’s skeletal remains showed a broken jaw with evidence of healing, indicating that he had lived with a painful jaw. There were also fractures in some shoulder bone(s). The skull did not show any signs of trauma, but an expert testified that a blow to the head doesn’t always have to injure bone to be fatal. At age three, Ricky’s homeless teenage mother relinquished her parental rights. Tim testified that Lisa would tie Ricky up in the basement. He would find Ricky in a diaper facing a wall as punishment, keeping a penny against the wall with his nose for as many minutes as he was years old (starting over if the penny slipped). She would strike him with her hand or a wooden spoon; locked him in his room without supper; handcuff his ankles; use a harness to restrain Ricky while shopping; stuff his mouth with a sock, duct-taping it closed, then duct-tape his head to the refrigerator. There are several reports of Lisa feeding Ricky only foods he disliked, such as sending him to school with a carrot sandwich. One day a neighbor found a hungry Ricky going through his refrigerator. Ricky told him that his parents “don’t want me anymore.” The neighbor also observed some unprofessional stitches on Ricky’s chin. When Tim later talked to the neighbor, he explained that a psychiatrist had diagnosed Ricky with “Ted Bundy disease.” The neighbor reported the incident to the police. Ricky was mostly thought of by teachers as a typical child, average or even advanced academically. But some problems appeared. At first there were only some brief moments of defiance. Later problems seemed to involve the effects of medications given to Ricky; and he was stealing food and looking for food in the trash. Typical of Attachment Therapy parenting, Lisa Holland tried to manipulate teachers, calling Ricky’s teachers one or two times a day. She insisted he be put in a special needs class and be taken to school on the special needs bus. Teacher were ordered not to give Ricky special foods with the other children, such as birthday treats. Pomerance stated that Lisa’s behaviors suggest “pediatric condition falsification,” a type of Munchausen syndrome by proxy. In other words, Lisa may have enjoyed the status of a mother caring for a severely damaged child. Or, added Pomerance, maybe she may just liked the “special needs” subsidies. When Lisa enrolled Ricky in second grade, she brought him to the school in a harness, holding him by a leash. She told his teacher was a poor student who would “be a real problem” for him. The teacher was alarmed that her derogatory comments were made in the boy’s presence. This teacher said that while she found Ricky to be a normal second-grader, Lisa continued to insist he was badly behaved. Claiming school was too stressful for Ricky, Lisa took him out of school in April 2004, claiming she would homeschool him. She hid this fact from the adoption social worker. Several therapist were involved in Ricky’s care, prescribing drug treatment in part on Lisa’s reports of his bad behaviors, which were characterized as strange and violent. Lisa resisted counseling sessions that were recommended for Ricky. When Ricky was taken to Catholic Charities of Jackson, therapist Susan Honeck diagnosed Ricky with Reactive Attachment Disorder. Honeck recommended Ricky needed special attention and should be the only child in a family. Aura Abedi, a child psychiatrist, testified that Lisa reported Ricky was getting more out control, defiant and not sleeping well. Abed thought that hospitalization might be necessary. Lisa complained to child welfare workers that Ricky was hyper, aggressive, sneaky, disruptive at school, putting others at risk, and didn’t always use the toilet to urinate. She pushed for a higher subsidy because he was so difficult. There was considerable criticism about how Child Protective Services and the Department of Human Services failed to rescue Ricky, despite four complaints of suspected abuse made by teachers and neighbors. Marks on Ricky’s wrist where he was tied to a bed were observed and reported. A teacher’s belief that he was being starved was reported. Recommendations by mental health professionals that Ricky have counseling went unheeded. The other children were not removed from the home after Ricky “disappeared,” even when they showed signs of being injured. The police were shocked to learn that at the same time they were closing in on the Hollands, yet another adoption for the Hollands had been finalized.